Each year, Al Sigl hosts an inclusive Tennis Benefit for players of all abilities. 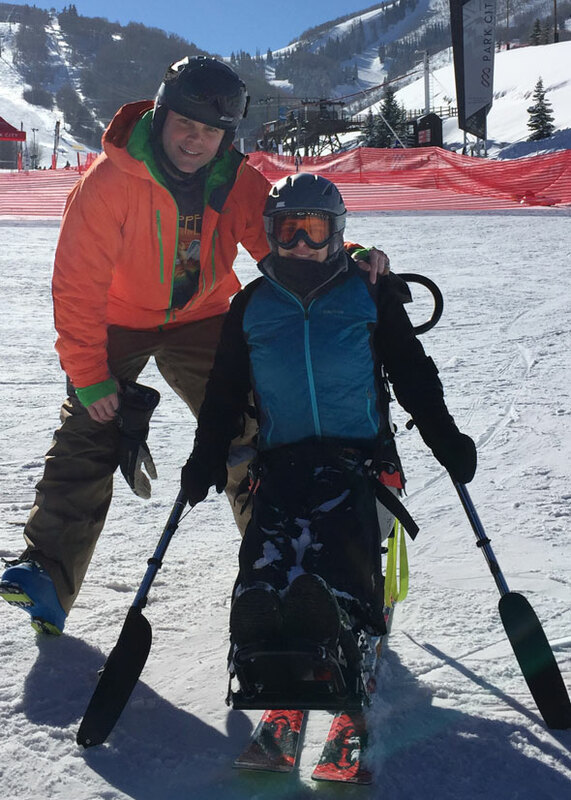 At this year’s event, Jen Truscott shared how the Al Sigl Community and adaptive technology had helped her rediscover her love of another sport – skiing. She spoke about how she was able to enjoy an activity she felt she would no longer be able to participate in, and how she was able to reconnect with others who shared her passion. She talked about how the experience had changed her life. “I grew up living an active life. I played many different sports and in college I discovered my love for Alpine Skiing. Being on the top of a mountain on a beautiful blue-sky day looking down and across valleys is truly my oasis. In 2001 things began to change. I was diagnosed with Multiple Sclerosis (MS). The National MS Society, an Al Sigl Member Agency, was a great resource as I learned how to adapt my life to the changes my body was going through. There are highs and lows with the disease and I have experienced many; from going temporarily blind to partial paralysis. By 2009, I could no longer work. I felt like I spent my days watching others, not able to join in activities myself. I longed to experience life as I had before. That is when I heard about Jimmy Huega, an Olympic Skier who triumphed over MS. His approach was to focus on what you can do, on finding modifications so you can be as active as possible. I learned about the sit-ski, which helps people with balance or mobility challenges navigate the slopes with another skier standing behind to help if needed. I realized that if an Olympic Skier could adapt in this way, I could as well. That was the first spark. Then the MS Society helped me connect with two great programs – Shared Ski Adventures and SportsNet, a collaboration between Al Sigl, CP Rochester, and Rochester Rehabilitation. They got me back on the ski hill and brought a new dimension of joy back into my life. I’m not strong enough to ski by myself. And I’m okay with that. I am grateful for the many volunteers it takes to get me on the mountain. I truly appreciate those who share their time to help me experience my love. When you take away the limitations your body places on you, you find exquisite courage. Your joy becomes infectious. I’ve learned that sometimes you have to have determination to find your joy. I’ve also learned that there are many around you willing to assist those that need a special hand. I had lived in Rochester for many years, before I moved to Seneca Falls. When I was diagnosed, I moved back to Rochester because of the quality of the services available here – these vital programs that receive support from generous friends and neighbors like you. Jen’s experience reminds us of the needs that we all share. We seek meaningful work, to live in a home of our choosing, to have access to the things we need and want, and to be included in activities that give us joy. Her story gets right to the heart of our collaborative mission – celebrating abilities and inclusion. We wanted to share Jen’s heartfelt appreciation for generous friends and neighbors like you who believe we can achieve more together. Thank you for strengthening our work together and helping make more stories like Jen’s possible. Thank you for sharing joy! With the click of a button, you can make a difference in the lives of children and adults with disabilities®! Sign up for our news e-mails by entering your e-mail address below.